It's been a while, and I hope you are well! All good here, just a bit hectic and busy. Nothing monumental at this time. But, I may have exciting news in the near future - fingers crossed. That's all I can say for now. In the meantime, warm greetings to you all! And a few new photos of the shop. 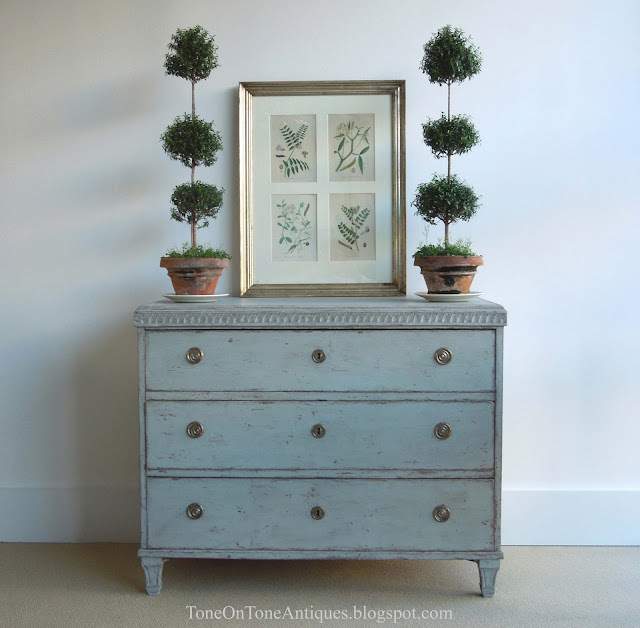 I photographed this Gustavian blue-gray painted chest over the weekend. It is a classic Swedish Gustavian chest in many ways: the leaf-tip trim, clean lines, and 3 graduated drawers. A pair of myrtle topiaries from Snug Harbor Farm flank antique Swedish botanical legumes. The silvery-gold frame is from the 19th century. 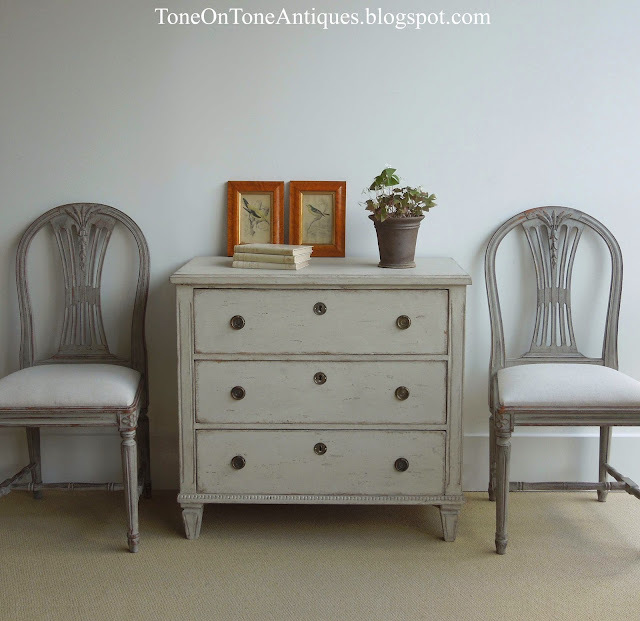 Two Swedish painted tables with very different forms. The top is a round tea table with a lipped edge and guilloche trim. 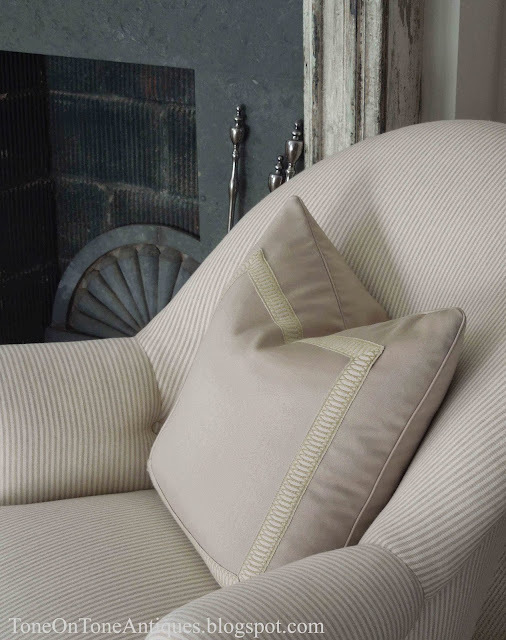 It makes a lovely center or side table flanked by club chairs. The bottom is a classical style console with candle slides. 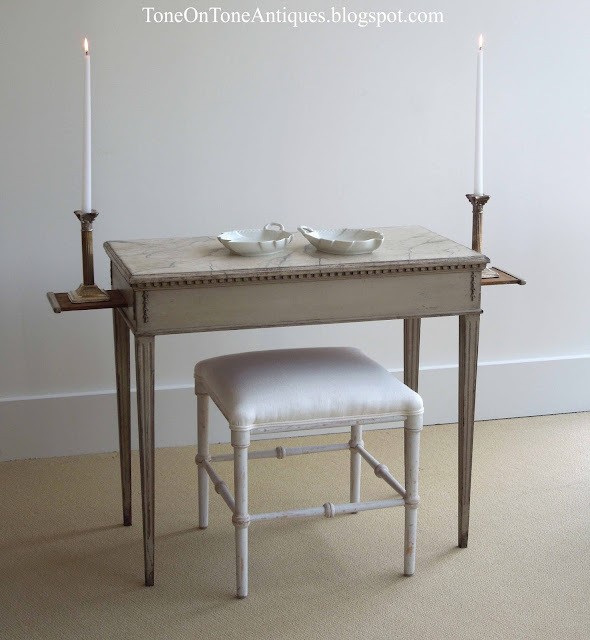 A pair of fanciful candlesticks would have been used on this console to illuminate a 19th century hall, I suspect. Another Gustavian chest, only smaller. This would've been used as a bedside commode. Notice the unusual beading on the bottom. More updates will be posted to Tone on Tone's website soon. Oh, we do have one change at home. I've become really fond of old Oriental rugs. Nothing precious or valuable, just the opposite. I've been on the hunt for tattered and worn Orientals....you know, almost threadbare. 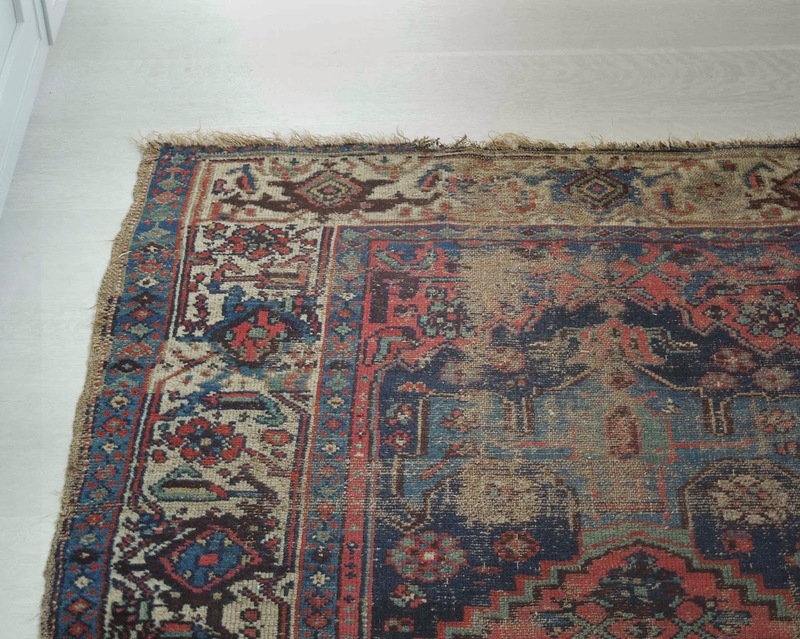 They can be difficult to find as most rug dealers will restore before selling old rugs. 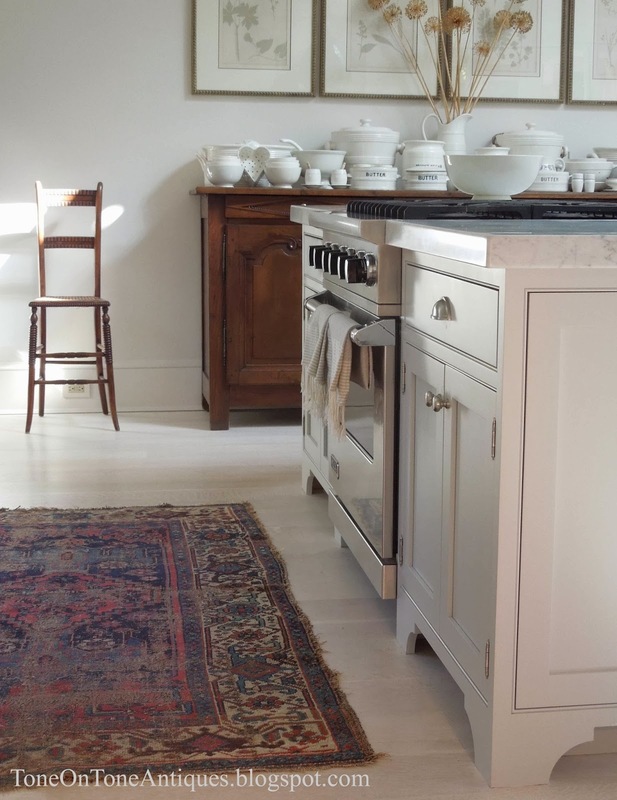 We love our rug - it's perfectly imperfect. And a warm way to cozy up the kitchen for fall. Huge thanks to Amy and Steve! Love you guys!! 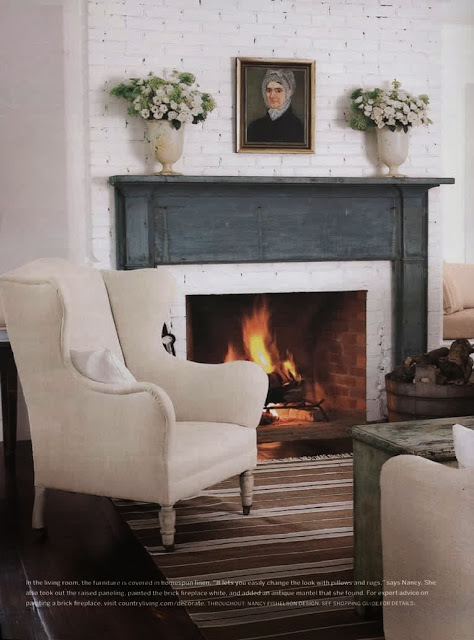 We'll soon be enjoying our fireplaces with fall here and chilly nights ahead. I think this is one of the highlights of the season I eagerly anticipate. It makes the transition from summer to fall so special. 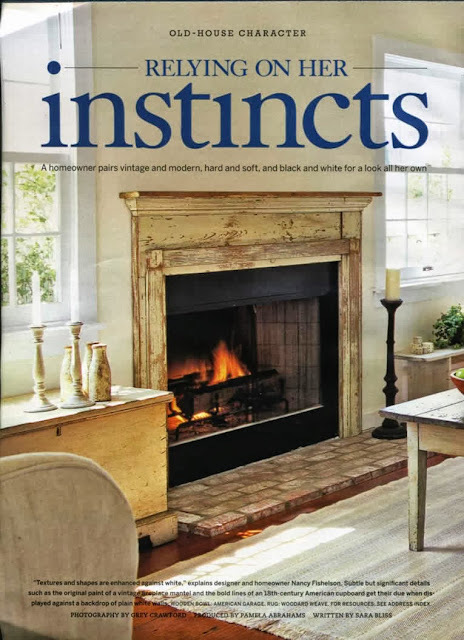 When we renovated our old home, I knew we would replace the lackluster mantels with more interesting ones - nothing fancy, just more soulful. 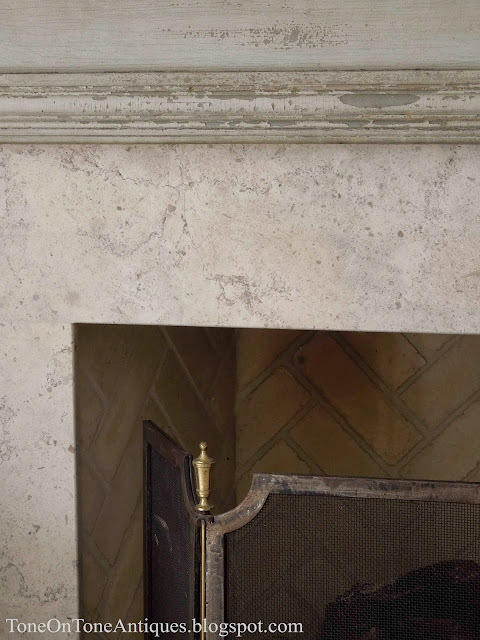 After all, the fireplace is the focal point of a room, and its mantel should say (but never scream) "look at me!" 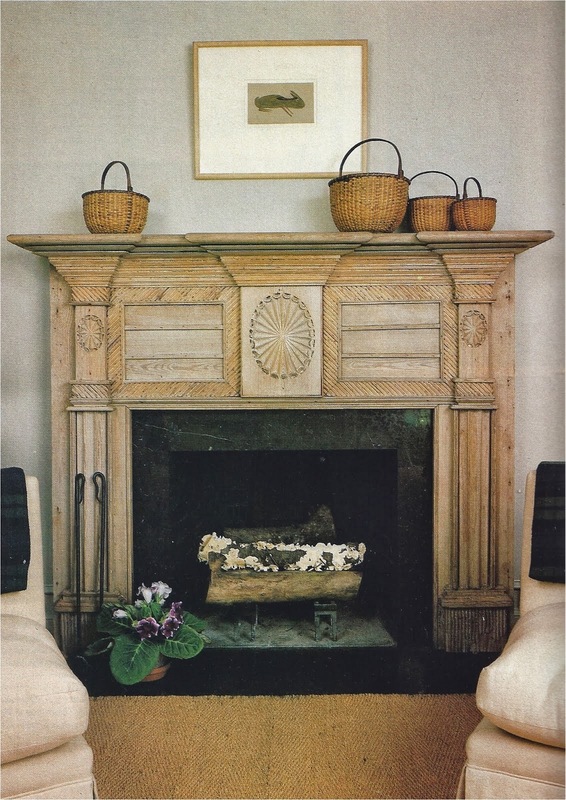 Whether lavish and ornate or pure and simple, I love antique mantels - especially early painted wooden ones. They add instant patina and character to any home. They are generally easy to install. Also, they are frequently found throughout architectural salvage warehouses, antiques shops, flea markets, eBay, etc. 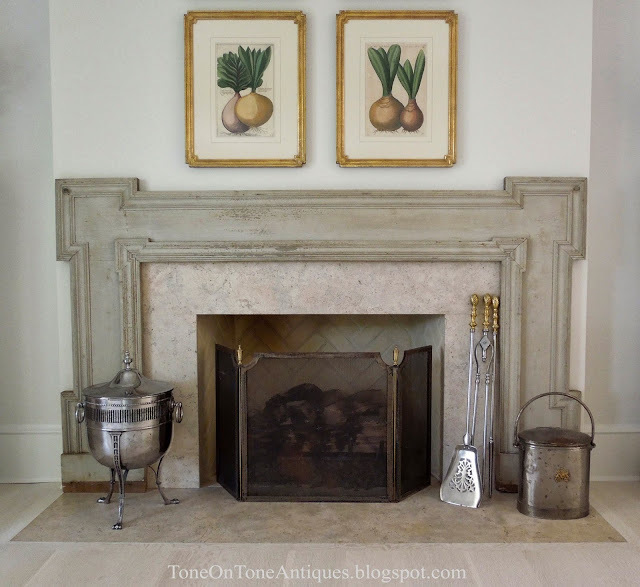 With the measurements of our fireplace openings in hand and a bit of searching, I found two antique wooden mantels rather quickly. And they were the perfect sizes requiring no alterations or modifications. 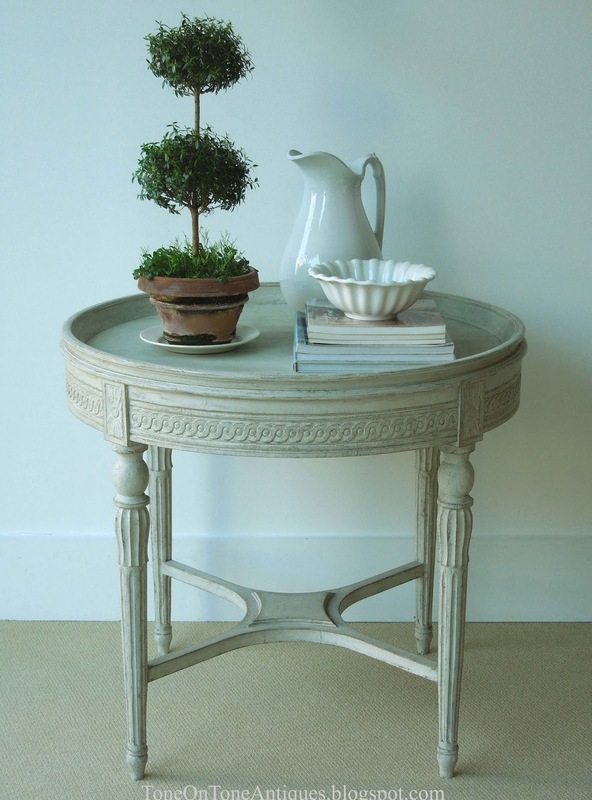 In our bedroom is this French mid 1700s mantel with original boiserie top. If this boiserie top had a built-in mirror, it would be known as a trumeau. 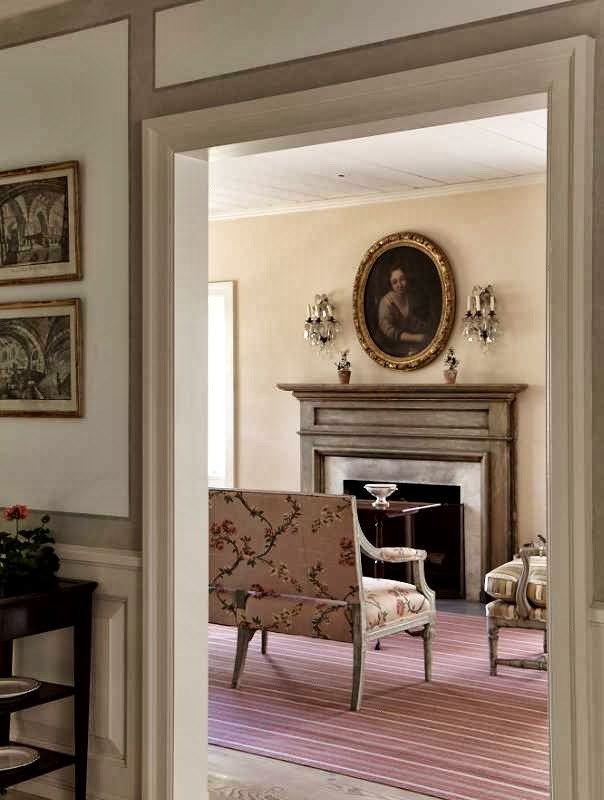 Most trumeaus were once parts of paneled rooms. The fancier ones would have a painting and a mirror. 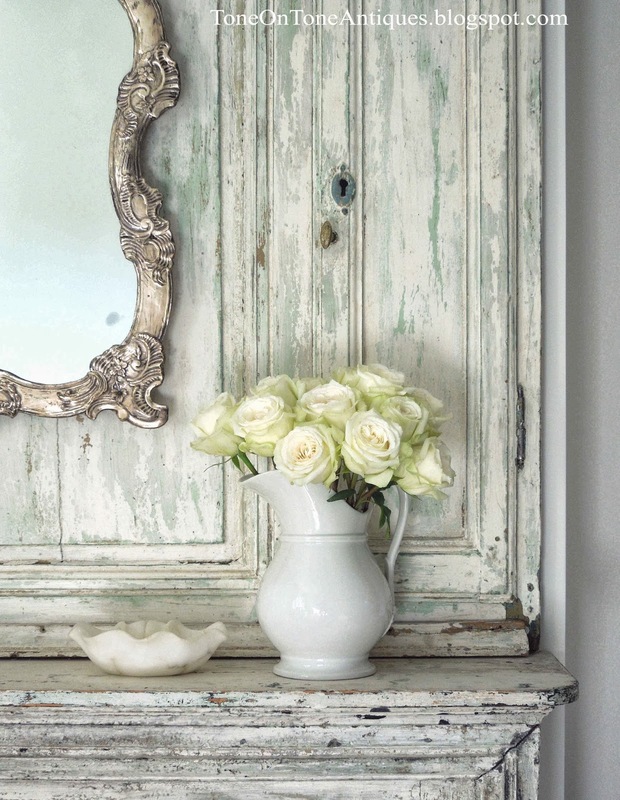 Ours most likely came out of a paneled room of a modest country house. I say modest because it lacks a mirror, carvings and embellishments. I love its crusty layers of early white, gray, and green colors. Notice the side doors which still operate. Someday I'll share what's behind them :) BTW, I've never shown this fireplace before so it's making an official debut here! 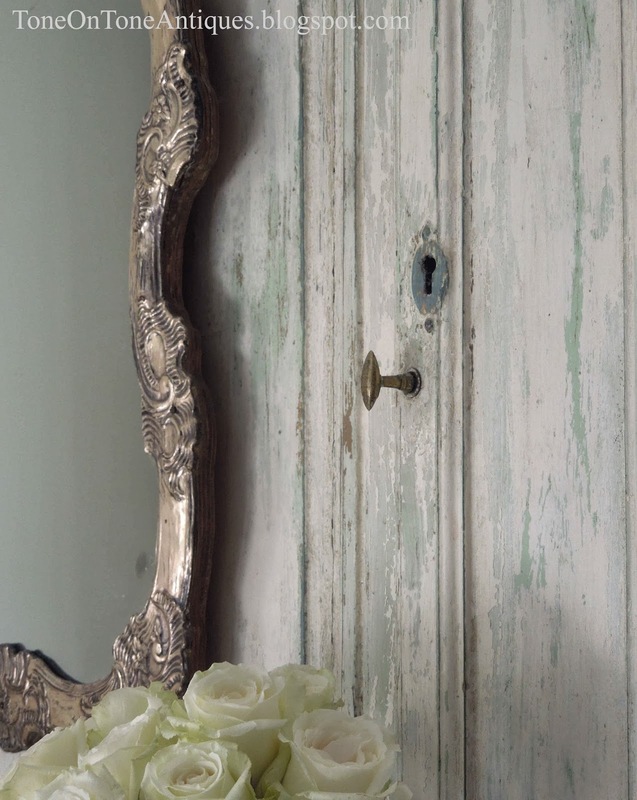 For now a French Regence silver plated mirror adorns the boiserie top. 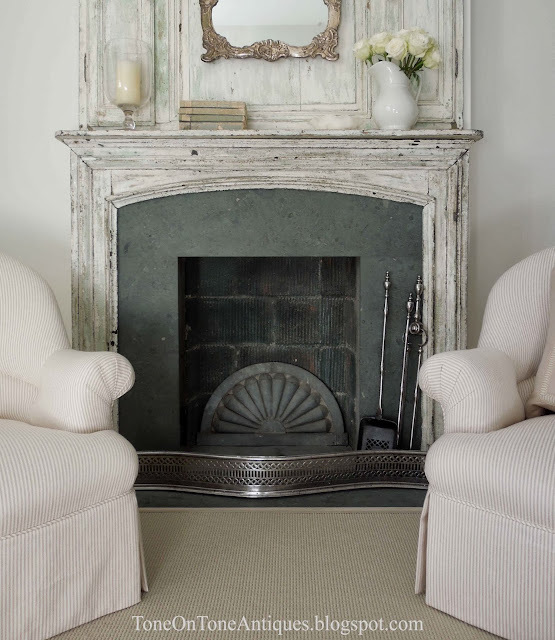 A gray-green limestone was chosen for the surround and hearth. The firebox still has the original clay tile liners. 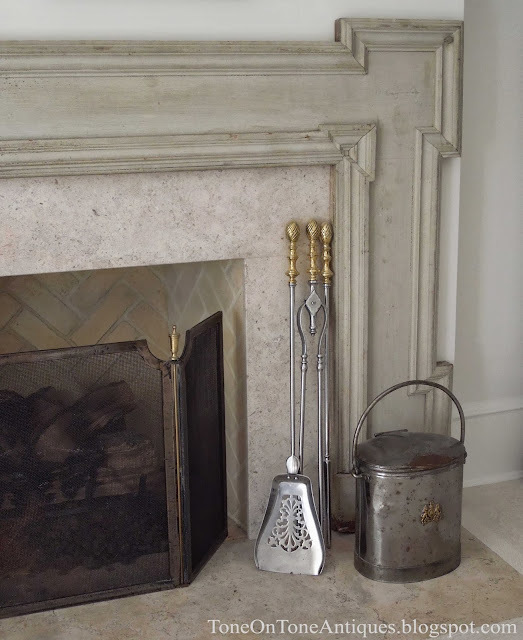 Antique English polished steel tools and fender are utilitarian and decorative. When fires are lit, the zinc architectural fan comes out and a mesh screen covers the opening. I'm looking for a tailored ottoman with legs on castors and streamlined floor lamps for reading. Any suggestions? The antique American mantel in our living room dates from the mid 1800s. It's flat profile and lack of shelf give it a clean look. 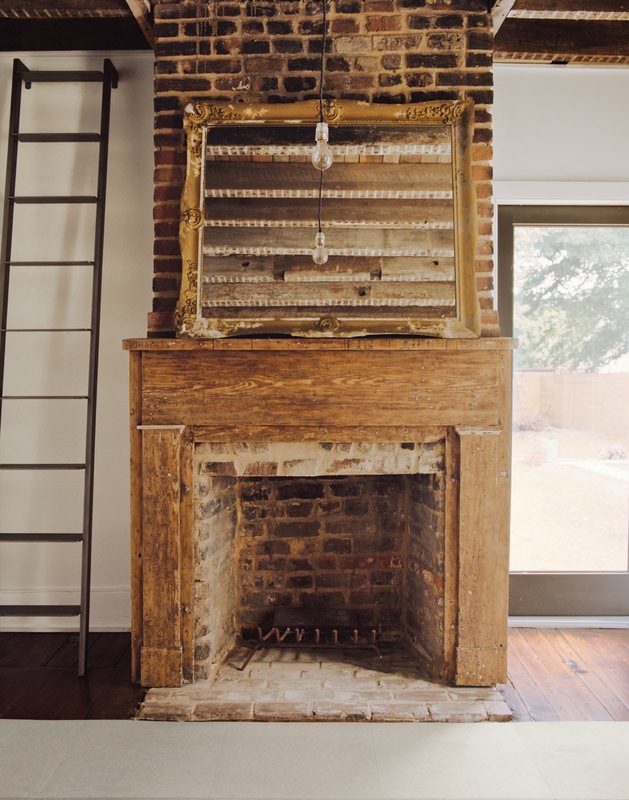 During the renovation, the firebox was rebuilt with beige fire bricks in a herringbone pattern, while Portuguese Gascogne Beige honed limestone was installed for the surround and hearth. We also converted this fireplace to gas. 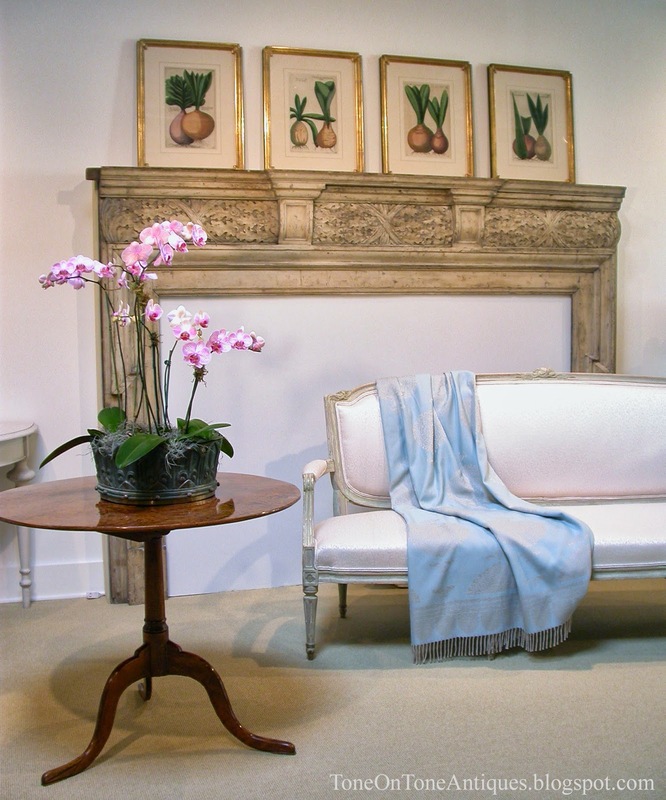 The antique screen is French. The large covered urn is for coal as is the small pail, and both are English from the 1800s. Also from England are the polished steel and brass tools. This old photo shows an English Georgian carved pine mantel in our former shop. I sold this monumental masterpiece to a client in Easton, Maryland. 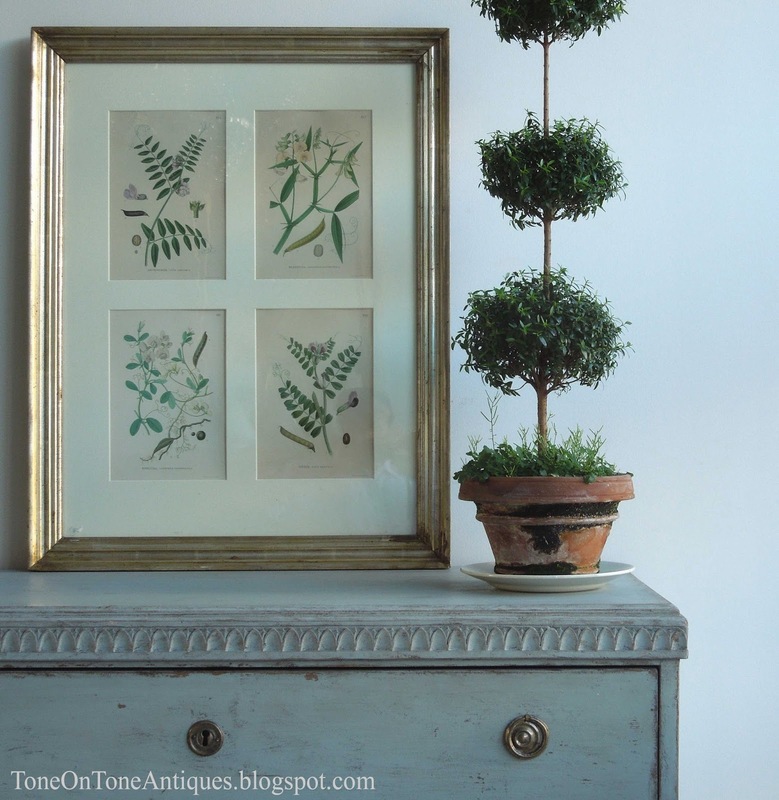 You might recognize the above photo from House Beautiful. The room was decorated by Katrin Cargill, and I adore it all - from the Swedish tea table to the Rococo armchair to the French Directoire mantel and boiserie top. Just divine! Above is another room from the same house decorated by Cargill. 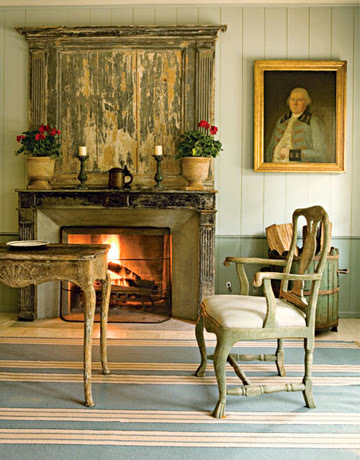 Notice the antique mantel here as well. 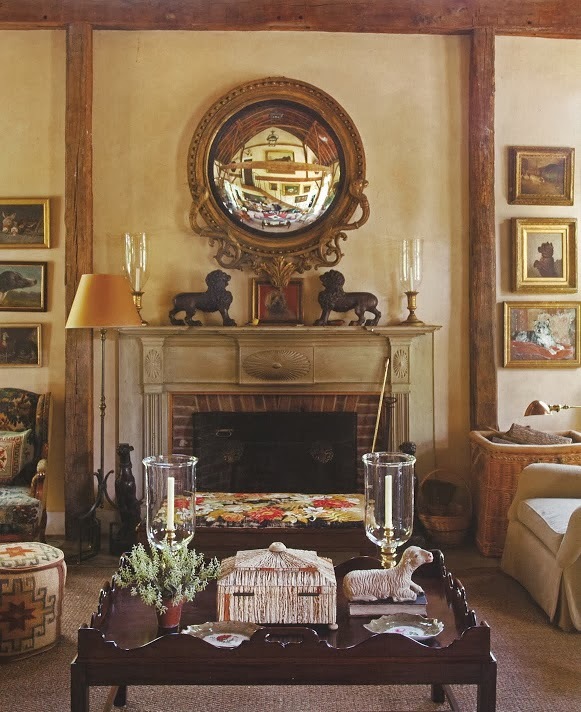 Welcome to the very famous barn room belonging to Bunny Williams and John Rosselli! 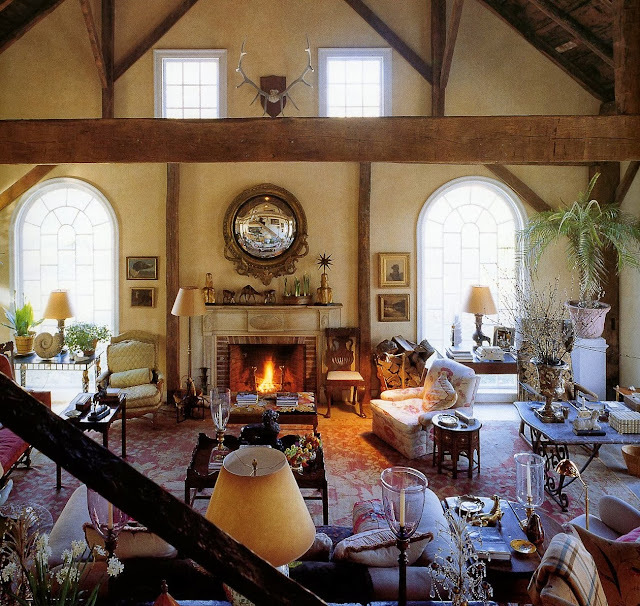 Each time I see this room, I want to move to an old barn. So warm and beautiful. So collected and layered. 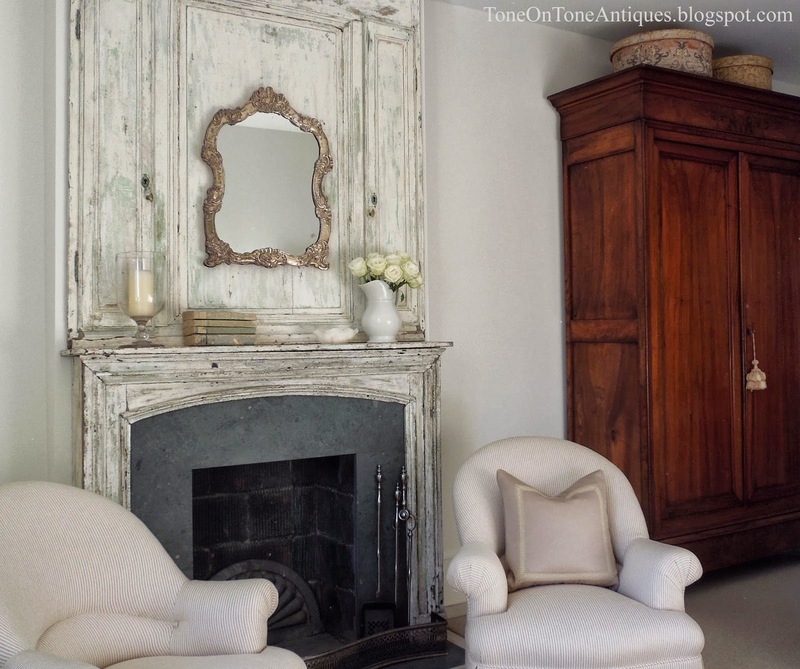 Look at that stately antique mantel!! 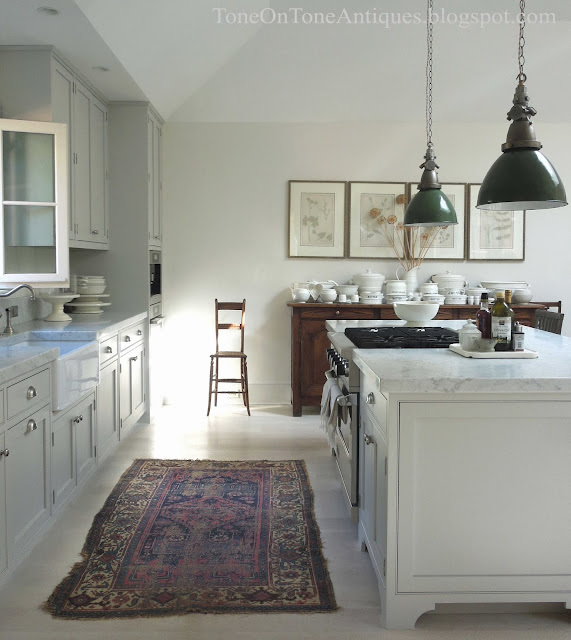 This carved architectural beauty (above) belongs to designer Nancy Braithwaite. It has a similar design to Rosselli and Williams' mantel, but the proportions are a bit quirkier. Perhaps it was cut down? Many thanks to my friend Billie for scanning the photo which is from the February 1985 (!) issue of Early American Life. Billie is the author of the blog "Kitchens I have Loved," and she regularly features the early works of many iconic designers: Bill Blass, Dan Carithers, Hugh Newell Jacobsen, John Saladino, etc. 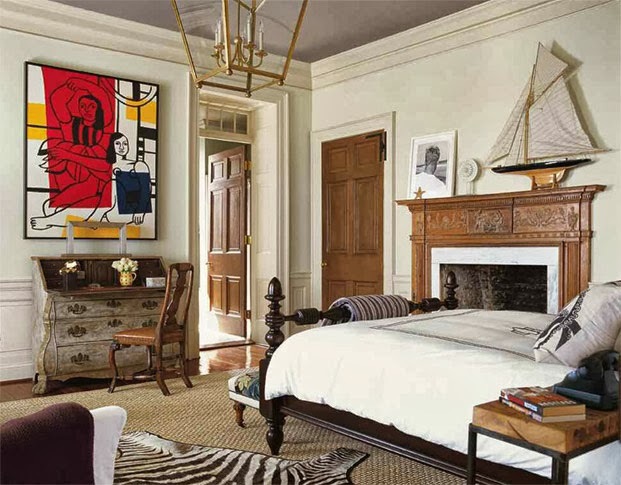 In Eric Cohler's Charleston bedroom is a handsome antique mantel, among many other fabulous items. Though traditional, this room is very chic and stylishly appointed. Since we are in Charleston, let's visit an awesome home with really soulful mantels. 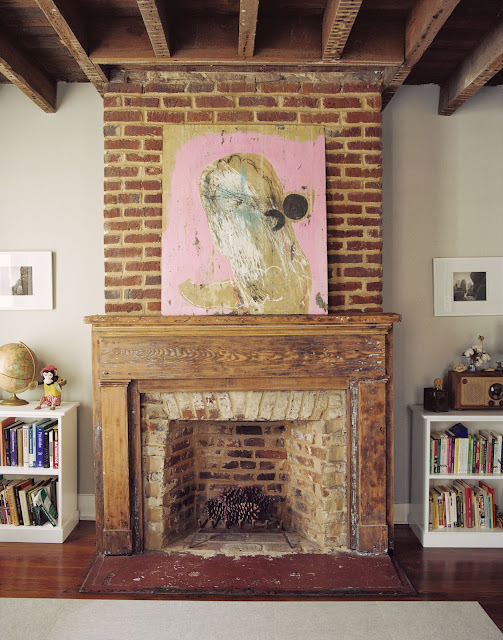 This home belongs to the uber cool Helen Rice and Josh Nissenboim. Together they own the design firm Fuzzco. 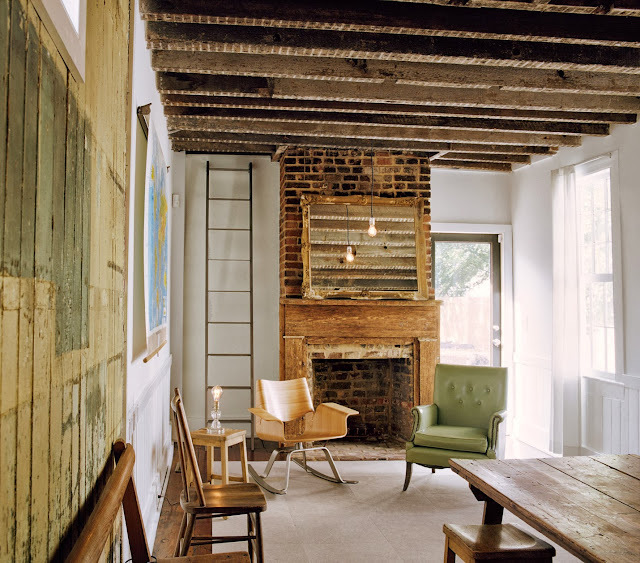 All photos from Dwell magazine. Looks like these mantels were stripped - such wonderful raw textures and simple designs! These next photos are from the portfolio of Nancy Fishelson. 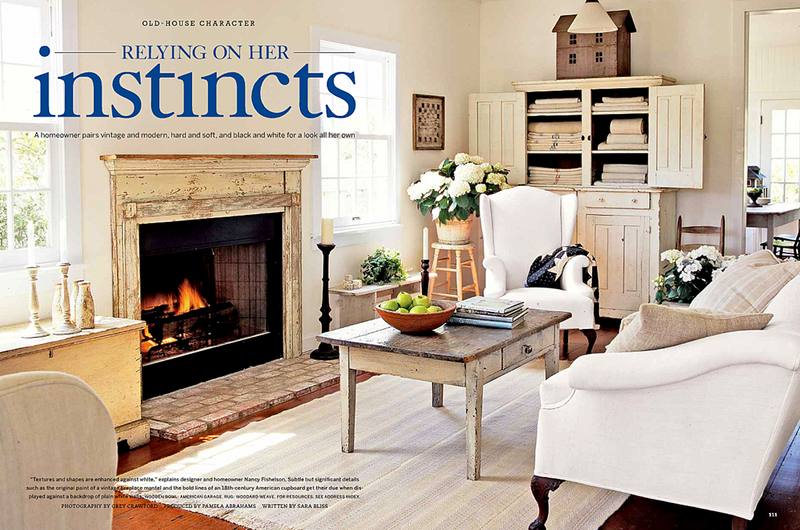 They were published in Country Living magazine. 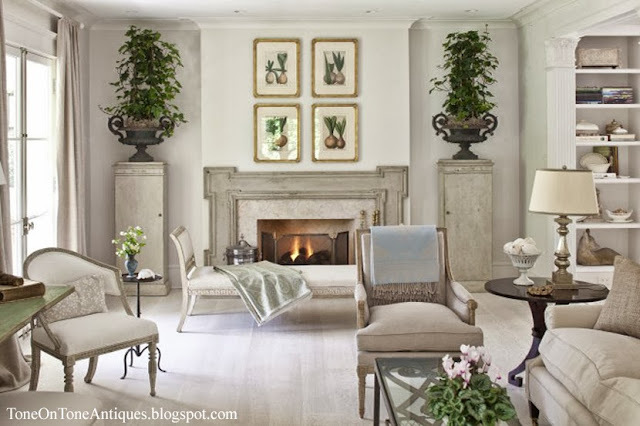 Fishelson is one of my favorite designers, and her interiors are always lovely, edited and neutral. 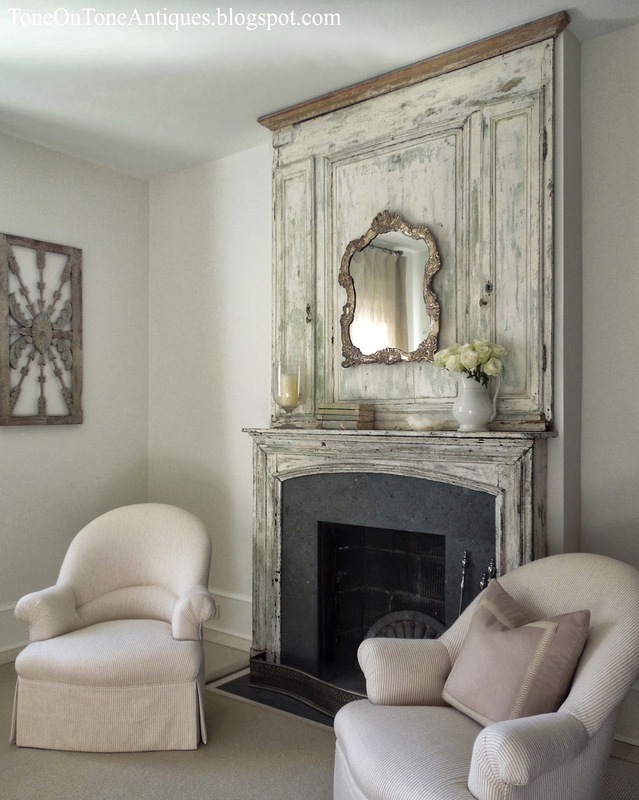 She frequently incorporates antique mantels into her projects. The overall look is high-country charm! - Measure both the opening and the existing surround on all sides. - Have your dimensions handy when shopping. - Taller mantels can be shortened. If there are plinths, they can be removed and put back after the legs are cut down. - Check your local firecode regulations regarding distances to combustible surfaces.